Feel Margolis Method and its ability to expand the performer's expressive and creative capabilities. Margolis Method’s dynamic energy jumps off the screen and inspires you to tap into your creativity. Active videos re-create the live studio experience. Reflecting over 30 years of research by Kari Margolis, and inspired by the work of such artists as Etienne Decroux, Jerzy Grotowski and Bertolt Brecht, the Method unites instinct and intellectual analysis and makes the vital connection between physical and vocal expression. The universal principles of Margolis Method are applicable to any theatrical style or aesthetic, ranging from abstract experimental to linear, text-based plays. Margolis Method offers you the tools to become an empowered theatre artist armed with the skill sets of the Actor, Director, and Playwright. Shape your schedule to suit your creative needs and lifestyle. The user-friendly navigation allows you to take advantage of all the learning opportunities and tools the site has to offer. Train for five minutes or five hours — the choice is yours. Whether you decide to take an entire class, review a single exercise, or look for a skill-building warm-up for a rehearsal or an audition, everything you need is at your fingertips. ACTIVE CLASSES contain multiple video lessons that guide you through actor warm-ups, introductions to concepts, foundation exercises, improvisation structures, suggestions for practice projects, and a wrap-up review. EACH LESSON includes drop-downs with detailed written information such as vocabulary terms, step by step descriptions of exercises, tendencies to look out for, and assignments to hone critical thinking and analysis. EXERCISES FOR DAILY PRACTICE are dramatic mini-scripts that help the actor manifest more expressively. Each exercise is preceded by a "teach-in" video that identifies dramatic concepts, their theatrical applications, and actor tendencies to look out for. The corresponding exercise lesson allows you to actively follow along and practice on your feet. ACTOR PREP warm-ups vary in length from five to thirty minutes and include a wide range of exercises to get your actor instrument energized, balanced, strengthened, and creatively inspired. 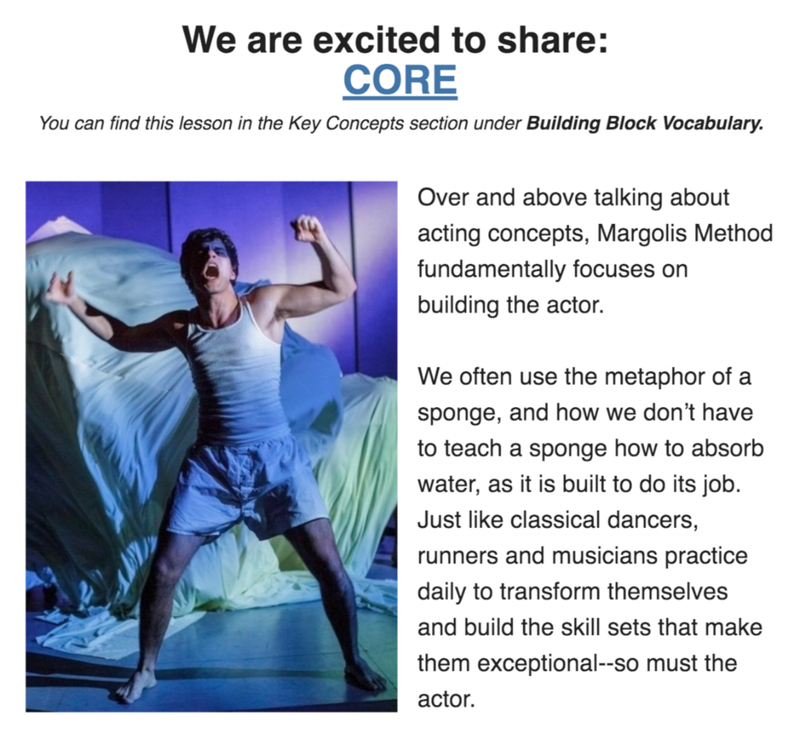 VOCABULARY AND FUNDAMENTALS are conveniently organized and include videos and written breakdowns of concepts that apply to every exercise, audition, rehearsal, and performance. View samples below, and experience philosophical writings, free lessons, member news, and much more. View samples below and feel the online experience. Theme One provides tools to start building the actor instrument--for, when it is built to do it’s job, an actor will innately know how to act! In Theme One you will be introduced to the fundamental principle of Margolis Method, that concepts about acting are only meaningful if there are clear, tangible ways for the actor to practice them. For example, actors are often told their characters must have a strong internal life and they shouldn’t externalize and show an audience what a character is feeling. This is certainly true, but how does one achieve this? The five classes in Theme One offer exercises and improvisations to practice manifesting a character’s internal private life as well as an external, social, public life. It is this relationship between the private and public that gives depth to a character and allows the actor to draw the audience in. The social rules that set limits and define the acceptable pubic manifestation of our emotions have made our bodies less expressive. Theme One’s classes offer specific exercises for building the actor’s ability to connect with and interpret their internal impulses. This ability further allows actors to distinguish and manifest the difference between what a character is feeling privately and what it chooses to express publicly. a total of fifty-one lessons. Class One: Introducing the Actor Instrument Discover practicable exercises for five fundamental concepts which re-envision, enliven, and build the actor’s instrument. Class Two: Expanding and Compressing the Core Offers exercises that allow the actor to feel how changing the physical conditions within a character’s core inspires emotional states. It also explores how the relationship between effort and relaxation helps the actor make connections between acting beats. Class Three: Expressing Through the Core in Vertical Learn how to find a character’s relationship to gravity and how it increases an actor’s storytelling ability. Class Four: Dialoguing Between the Personal and the Public Helps shape a more sophisticated actor who can make smooth transitions between a character’s personal thoughts and emotions and their public manifestations. Class Five Part I: The Geometry of Intention Introduces two classic Lines of Force and establishes powerful choices the actor has available from any dramatic situation. Class Five Part II: The Geometry of Intention Duo Improvisation Offers tools to start building strong interactions with other characters and inspire an audience to discover deeper meanings within these relationships. Theme Two encompasses concepts and exercises to increase the actor’s ability to vocally express with more passion, spirit, and intonation by finding the natural relationship of the actor’s entire muscular instrument to the voice. Theme Two classes allow the actor to feel how changing the muscular conditions of the character transforms the essence and emotional quality of the voice. Class One: Supporting the Voice Works with the natural flow of gravity and helps the actor develop the ability to feel how their relationship to the floor can be a powerful tool for supporting and controlling the voice. Class Two: Placing Emphasis with Breath & Voice Develops a wider range of expressivity and offers exercises to help the actor avoid being repetitive when interpreting text. Class Three Part I & II: A Character’s Inside & Outside Voice A two-part class that applies vocal/muscular skill sets to the expression of a character’s private and public states of being. Exercises reveal how the actor can inspire an audience to understand more about a character by sensing whether they are speaking from their inner private world or with their social public voice. Class Four Part I & II : Manifesting Vocal Qualities of Vowels Builds on the skill sets of Classes One and Two, while adding specific conditions to explore a round, sensual quality of a vocal state of being. Exercises in this class focus on the skill of justifying the emotional quality of a sound by manifesting conditions with the entire body. Class Class Five: Journeying with Vocal Transformation Culminates the previous class research to build stories through journey improvisations across the space based on a character’s conditions and vocal expression. Theme Three offers tools to enliven and increase their ability to manifest more sophisticated, expressive, and rich emotional states that inspire the audience to feel and understand a character on a visceral level. Theme Three classes allow the actor to practice various ways to stimulate their own exploration of character, demeanor, and emotional transitions. Class One: The Direction of Emotional Inspiration Explores character and power relationships through how high and low energies inspire specific demeanors. Theme Four equips the actor with tools to create richer stories through the poetic use of space. By enlivening the theatrical space, the actor can inspire the audience to feel metaphorical relationships or dramatic tension between characters, how big a character’s universe is, what limitations a character’s world imposes, and so much more. Theme Four classes allow the actor to practice concrete skills to explore space in a poetic way to stimulate both the actor’s and the audience’s creativity. Class One: Lines of Force Through Space Develops the actor’s ability to create story through three classic lines of force in space: depth, oblique, and lateral. Theme Five classes reveal the potential to transform everyday objects into a theatrical extension of a character’s inner world and offer practicable skill sets to manifest these ideas. By imbuing objects with gravity, dramatic weight, and nuanced characteristics, they come to life with metaphor beyond their mundane meaning. Theme Five builds skills with various scholarly objects with specific geometrical properties and transposes them to dramatic objects to find new and engaging stories and relationships between the actor and objects. Class One: Establishing a Geometric Relationship to an Object Creates theatrical relationships with a stick through clear geometric lines of force. The stick is the simplest of all the scholarly objects and is the perfect tool for feeling an object’s line of force, gravity and vertical and horizontal qualities. The stick is explored in a manner that imbues it with the energy of another character, allowing the actor to feel potential relationships possible with an object. Margolis Method Online is a dynamic, ever-expanding platform WITH OVER 250 LESSONS, which will continually grow in content. Live classes and personal mentoring along with performance coaching are ALSO AVAILABLE. *All artists who attend programs at the NY Center are offered 50% discounts on online learning memberships. Full single payment includes one free video upload for personalized feedback -- a $75 value! Inquire about live Skype sessions and monologue packages. "We opened a show tonight! It felt really, really great, and I got a lot of really positive feedback on my performance. I just wanted to say it would not have gone nearly so well if I hadn't done your 31 minute actor prep from the web site beforehand. The last few rehearsals I had been struggling to consistently feel connected to my core, to the space around me, to other actors... so I knew I needed it and I knew it would make a huge difference. It 100% did. It's so reliable it almost feels like cheating sometimes." "I spent the wee hours of this morning before my first class DEVOURING the online training website. I cannot believe how much work has been put into it--it is INCREDIBLE. So clean and clear and definitely the most thorough online learning program I have used and explored. I am overjoyed by this tool to aid in my own progression and exploration through the exercises as both student and teacher. The specificity with which you analyze, explain, demonstrate, lead, and inspire the online artist's journey through the material is truly remarkable. The experience is so complete on so many levels - visceral, intellectual, emotional - as well as application of critical thinking skills, reflection, and self-evaluation. This is clearly a labor of love that is WELL WORTH the investment (and then some)!! Many congratulations and deep thanks for your efforts - the layout is user friendly, professional, easy to navigate, aesthetically pleasing and also stimulating! I am just beyond thrilled!" "I am always a skeptic. I am a hands on learner, a learner that needs to be in the classroom, not learning through a textbook online. When I heard about this opportunity to continue my study of the Margolis Method, I was excited yet I didn't think it would be for me. I need to be in the room, breathing the same air. The Online Learning site has exceeded my expectations. It's like Kari and the team are right there with me. I love the feature that there are both videos and written work. It is challenging, yet they break the concepts down for you to understand -- and no matter what level you are at there is something to constantly be learning. I love the Actor Prep warm ups. I'm currently using them before I head to rehearsals for a show that I am in. This helps me to understand my body, awareness, and how I am moving in space. It is so neat to be able to fully understand how a thought can expressed outward. I am grateful for this Method to be transported online so I can continue my study from afar. I have grown so much as an actor even within just a few times working with the site! I have learned and grown so much through the program. I have taken these skills and applied them to the show I have co-created for the MN Fringe. This has been extremely helpful in my artistic career. Thank you! The actors work out and prep have been most helpful as I prep for rehearsals and applying it to what I do as an actor. It has changed how I view my body, skills, and art form."